I've been a bit absent lately, due to family commitments. But here I am, over the bugs that have been hanging around and glad to 'talk' to you all again. As promised here are the first of several book reviews. These two are by Mona Hodgson. She has written extensively for children and for magazines and newspapers. This is her first foray into adult novels. The year is 1896 and the four Sinclair sisters are living in Maine with their widowed father. When his work moves him to Paris, he decides it's time for the two older daughters to marry. He chooses a mining town out west as the best location for them to settle. In TWO BRIDES TOO MANY, mail order brides Kat and Nell Sinclair, travel by train to Cripple Creek, eager to meet their future husbands. But when they step out onto the platform nothing goes to plan. Cripple Creek is in a state of emergency as the second fire in four days sweeps through the town. And there are no husbands for the sisters. The story takes us through a time of repair and renewal in the town and in the hearts of the sisters. Along the way we meet an eclectic cast of interesting characters. My favourite would have to be Boney, an old miner who turns up at the most opportune moments. 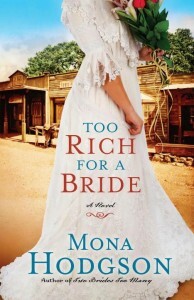 In TOO RICH FOR A BRIDE, it is a year later and the third Sinclair sister, Ida, heads for Cripple Creek. Nell and Kat who have found husbands are keen for Ida to find one for herself, but she has other things on her mind: business. Having completed a course at business school back in Maine, Ida attains a position working for real life business woman, Molly O'Bryan. But two men attract her attention: one is a lawyer and colleague, the other a Californian pastor helping out with his father's ice box delivery company. Which one will she choose, or is the lure of business too strong? I enjoyed both of these inspirational historical romances. The first story was predictable, yet I kept turning the pages. There were so many intriguing characters and the setting was described perfectly. I particularly liked the sister Kat. She had a strong personality and I liked that she was a writer. The second story was much stronger. Ida zinged on the page right from the start. Set in the male dominated times of the 1890s, Ida meets resistance at every turn as she seeks to become a successful business woman. And matters of the heart are fraught with complications. For me this made a much more exciting story. Characters from the previous book, including Boney, turn up again and provide a real depth to the story. Mona Hodgson plans to pen two more books in this series. I look forward to reading her next story. You can read more about Mona and the Sinclair sisters here. And if you go to 'videos' on the left hand side of her site you can watch her walk through the streets of Cripple Creek. These reviews are part of the Historical Reading Challenge. I should have said I read them on Kobo. I'm not sure they're available in NZ otherwise. I like that you can see a clip of the author in the actual town the stories are set. A good promo device for us to store away in preparation for our own successes!! It sounds like a promising series. I just finished Alice Hoffman's The Red Garden, which follows the history of a community (fictional in this case), from its founders on down to the present time. It sounds like Hodgson might be trying a bit of that herself with Cripple Creek. Too many authors forget that the setting is so much more than just a background for the characters.